In this post we’ll further demonstrate how to maximize a Delta award booking by adding a free one-way ticket to an international reservation. This is a widely known benefit of the Delta program but is not frequently used by many Delta elite members. So we thought a demonstration post will help all those of you out there that are interesting in maximizing your award tickets. A stopover is an intermediate point in one’s journey. The stopover is one of the best tools a frequent traveler can use to maximize the award ticket. A stopover can be used as far out as the schedule permits. Since Delta’s schedules go out ~330 days in advance, that is a lot of time to maximize an award booking on an international itinerary. You can view Delta’s award ticketing rules on their website. A prime example of how to successfully use this tactic is how we used it on an award booking back in 2009 to go to the Seychelles, Mauritius, and Paris all on one ticket. 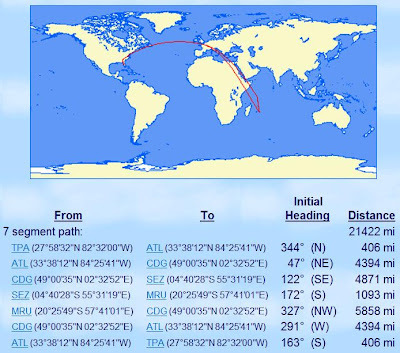 We used only 120,000 Delta SkyMiles (per person) for business class tickets half way around the world. Finding availability is the most important part. We have a trip to take Baby Weekly Flyer to the Caribbean this winter, so I thought this was a perfect opportunity to add a free one-way ticket on the outbound. For the upcoming SMD4 I needed a positioning flight back from Chicago to Atlanta. So I first checked availability from Chicago (ORD) airport. The low award availability was good. The best part is that we could even fly the oldest plane in Delta’s fleet. The DC-9 is Delta’s oldest flying plane with an average age of 34 years. The DC-9 planes will be retired in 2013. I also checked Chicago Midway (MDW) airport low award availability for Delta flights. Both showed great availability the low level. Next, I called up the Delta agents to add the domestic leg to an existing international reservation. Knowing your Delta award benefits will help you maximize award value. If you need help maximizing your award bookings, consider using the Points, Miles & Martinis award booking service. We know how to maximize award tickets since we’ve booked most of these awards for ourselves. DeltaPoints recently asked us some questions about our award booking service, you can see the full interview over at DeltaPoints.